It's not hard to see why PC gaming isn't so straightforward for the modern casual gamer. Graphics can look better on PC than on console, but most people own a laptop instead of a desktop these days and the price of high-end graphics cards is still scarier than the combined efforts of a horror film festival. But there is another way. Steam Machines are hailed by many as the future of PC gaming in the face of the competition from the PS4 and Xbox One. A Linux-based OS like SteamOS cuts down on system overheads, and means you don't have to fork out for an expensive Windows license - which itself adds almost £100 (or $119, AU$149) onto the price of a gaming PC. But SteamOS boxes have been delayed again and again, so we thought we'd have a go at making our own Steam Machine, now that the SteamOS beta is available to all. But we're not going for half measures. We're out to see what Steam OS box you can make for less than the price of a Sony PS4, £350/$399. And we set a few rules to make things even harder. The first rule of the TechRadar Steam Machine club is that you need a dedicated graphics card. A PC isn't a gaming PC unless it has dedicated graphics, no matter how much integrated chips have come on in the last year or so. The second rule we set is that the Steam Machine needs to look somewhat-OK in the lounge. Who wants a 3ft high box sat next to their TV like some kind of nerdy air conditioning unit? After all, we are trying to make something that's an alternative to a PS4, not a centrepiece for a LAN party. These are the bits that make up any computer. We'll look into exactly how you put them all together in a bit – it's not quite as scary as it seems – but here are the components we hand-picked to make our SteamOS machine. With a relatively low budget, we couldn't really afford a super-high-end graphics card. However, after having a chat with NVIDIA, whose graphics cards are currently afforded the best support by SteamOS, we decided on the GeForce GTX 750. The 1GB version is available for as little as £80, it's not particularly power-hungry and offers good performance for the price. It's one of the new NVIDIA Maxwell generation GPUs, designed to bring pretty good gaming performance across the board at 1080p resolution, with low power use and low heat output. As our Steam Machine is intended to work primarily with 1080p TVs rather than super high-end 4K monitors, we're pretty happy with that. How does it compare to the PS4? The PS4 has a Radeon-based graphics processor that's said to be roughly comparable with the Radeon R9 270x. And, yes, that is a cut above the GTX 750 we've used in our build. It is similar in power to the GTX 760, which was a bit too pricey for us on this occasion. However, there's not a huge gulf between the two, and the GTX 750 can handle modern games. When buying a motherboard, your choice is largely dictated by a) the kind of CPU you want to use and b) what sort of case you're after. 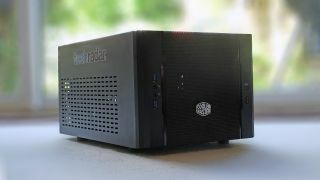 As we want to use a nice small lifestyle-y case, we needed to go for a mini ITX motherboard. This is the smallest type of 'mainstream' motherboard – smaller than the micro ATX and ATX kinds. There are those smaller still, but good luck trying to fit a proper graphics card in them. Our Gigabyte motherboard fits AMD CPUs, and comes with most of the extras we need, such as Wi-Fi, built-in. The joy of a proper PC motherboard is that it's pretty easy to upgrade. An obvious level-up for our Steam Machine would be to bump up the RAM, or to add another hard drive or SSD. Could you do that easily with a PS4? Absolutely not. A bit like the graphics processor, we had to cut back a bit with the CPU in order to stay on budget – we're making a Steam box here, not a blockbuster movie. Intel makes the most powerful CPUs, but AMD offers good bang for your buck in its A-series range. Generally speaking, AMD's processors give you better integrated graphics performance, but worse overall performance. For just £40, we got a mid-range processor, the 3.9GHz AMD A6. For a real SteamOS powerhouse you'd want an AMD A10 or a Core i5/i7 from Intel. But we'll see how it does with this one. You can't really directly compare the CPUs used in PCs and consoles, as the ways they are used by their respective systems is completely different – consoles are generally more efficient. However, the AMD A6 processor in our build has two 3.9GHz cores where the PS4 has eight cores running at a much lower clock speed of up to 1.8GHz. If we weren't building to such a tight budget, we'd really want to have a quad-core processor. And probably a higher-end AMD A10 one, if not one of Intel's snappier Core-series processors. Ideally you'd want to have 8GB of RAM in a gaming PC, but we've had to make do with 4GB in our build. However, this being a PC you can quite easily upgrade that in the future. We deliberately got our 4GB RAM in a single stick to make sure we'd have that chance – our Gigabyte ITX motherboard has two slots for RAM, not one. An extra 4GB of RAM costs just £30, making it a good future upgrade. With a bit more money you might also want to buy faster 2000MHz RAM – we stuck with 1600MHz. Looking at the PS4's RAM, you have to marvel as the sheer specs you get for not much cash at all. The console has 8GB of RAM, and it's much faster than the core system RAM in our build. It's GDDR5 RAM clocked at 5500MHz – the kind of RAM you'd find in a dedicated graphics card, not core system RAM. The 1GB of RAM in our graphics card is a bit more like the PS4's RAM.